Okay ... I must admit ... 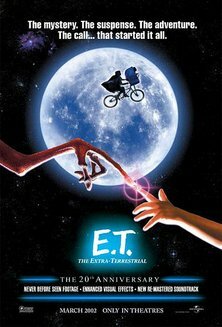 I still love E.T. I think I like it so much because that WAS my childhood. The bicycles, the D&D, the late nights with friends, the whole thing (excepting the alien ... wink). So I've been working on playing my favorite melody from the movie and got a somewhat passable version recorded over the weekend. I am going to try and do this with more orchestra instruments later but for now I was just happy to get to the end on the piano. Enjoy.